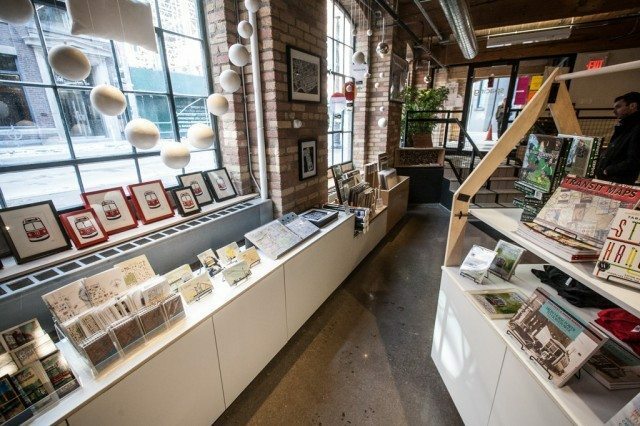 Spacing, the Canadian magazine that celebrates our cities, is extending its retail reach, opening a bricks-and-mortar store at 401 Richmond. The new shop features a vast and varied book selection, Toronto-centric clothing and housewares, and locally made goods. The magazine has been selling some of these goods from its online store for the past year and a half, but most of the in-store offerings are new, crafted by artists that Spacing has sought out, or vice versa. Here, you’ll find products that are well-designed—nothing turned out on a conveyer belt. The plan is to keep the selection fresh by having new items—by local artists—constantly rotated into and out of the shop. The shop’s aesthetic is smart and clean. Most impressive is the book selection—arranged by the front door, in the shop’s reading nook—which includes works by celebrated urban planner Jane Jacobs and Mark Osbaldeston, author of Unbuilt Toronto. Moving further into the shop, you’ll find hand-printed streetcar pillows, repurposed metal sculptures, and too many buttons to count.